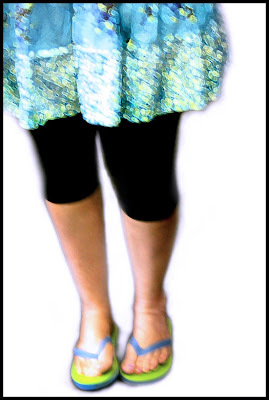 The green flip-flop soles for St. Patrick's Day, the skirt for me to be playful in, and it only took ½ hour to get here, but this is Texas, y'all - we drive! But I am vehicle-less today, and decided the weather was just fine, a bit foggy when I set out, but I've always wanted to know how long it would take me to walk it, and it was not too bad. I saw mounted heads-o-Buddhas on display at a white house with a porch that went all the way around it & made me quite jealous that it wasn't mine, I followed ever-so-convenient pale aqua arrows spray-painted on the streets, pointing exactly in my direction, I was accompanied by a black & tan pit bull for part of the trek, I saw wisteria blooming all lavender & purple & no doubt in places where it wasn't meant to be, but you know how wisteria is, and I saw azaleas bursting out all pink & magenta & white & I promised myself that this year I will do the tourist thing & take pictures of the Azalea Trail - I live right in the middle of the whole shebang, in the house-with-no-azaleas, just ½ block from young girls dressed as Southern Belles, but I never take pictures, but like I said, I talked myself into it. I am still painting, and it is quite hopeless at the moment, but I have faith that that will change. I keep plugging away, slathering on gel & paint & paper & gesso & more gel, and soon it will come together - I know this in my heart - but truly, right now, it looks quite pathetic and sad, and the canvases are wondering what on earth I am doing to them. I tell them I am playing. coming here is as good as stepping outside and taking a deep breath of whatever nature has to share with me. it leaves me feeling lighter and filled with lots of organic patterns dancing across my heart. Keep unfurling. I know you. You'll discover the beauty in no time and all the work in unearthing it will have been pure joy. If I were to walk to work, it would take nearly two hours, but I would have cows, fields, rivers, or wild turkeys nearly the whole way. I love how you are unfurling...that is such a perfectly playful and creative word. You just keep unfurling. And keep playing too.